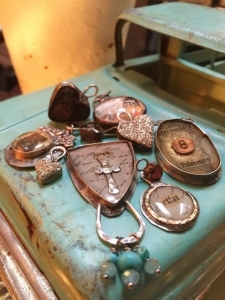 Let’s learn the secrets to making tiny bezels in a variety of sizes! I will tell you that they are addicting and will be a compliment to any of your jewelry designs! When you see how easy these can be, you will instantly fall in LOVE with creating them! In this workshop, I will teach you how to make these gorgeous bezels with your soldering iron! I will discuss the metals I use for bezels – from ones I like to use and where to buy them. You’ll also learn about metal stampings, ice resin, and more. There are lots of fun secrets that I’ll share in this workshop!